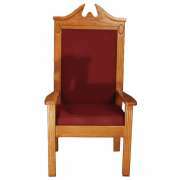 Solid oak pulpits and pulpit chairs can greatly enhance a spiritual atmosphere. Our pulpit furniture is made with loving attention to the details that make church furniture stand out and inspire congregants. It reflects the moving spirituality of a church service. 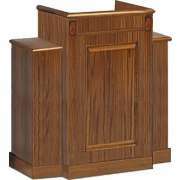 Where can you find elegant pulpit furniture? 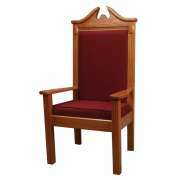 Choose from our collection of handcrafted solid oak pulpit furniture. Our stained or painted chairs and podiums will complement your décor beautifully. 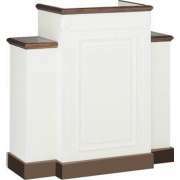 Hertz Furniture&apos;s attractive pulpit furniture looks impressive, and is available at budget-friendly prices, which is quite helpful when furnishing a house of worship. How can I make my church a more spiritual place? While the contents of a sermon and the seriousness of a prayer service can create a spiritual atmosphere, physical surroundings have a great impact on concentration and focus as well. When you furnish a sanctuary or chapel with elegant church furniture, you demonstrate the importance of a house of worship. When congregants see how respectfully the lay and professional leadership treat the house of worship, they are likely to follow suit and be inspired in turn. Once comfortable church chairs have been secured for all congregants, attention should be paid to the pulpit area. In a classic setup, all of the congregants face the pulpit, so you want to make sure that their eyes are focused on inspiring and appropriate images. Elegant pulpit furniture frames ministers, priests and other church leaders, promoting the regard and respect that they deserve. How can I coordinate the pulpit furniture? All of our pulpit furniture is tasteful and majestic. 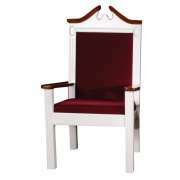 To achieve a harmonious effect, you can order coordinated pulpit chairs, church podiums and communion tables. 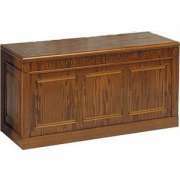 All models come from Imperial Woodworks and are available in both colonial and stained style. Colonial provides the purity of white while natural wood stain has an organic wholesome appeal. 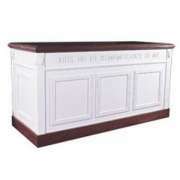 Communion tables are simple yet elegant. They are distinguished by dignified detailing. A stately communion table makes an appropriate centerpiece for the front of a church. A plain straightforward design draws the respect that is worthy of the venue without serving as a source of distraction. How can I enhance the church decor? When a sermon is delivered or prayers are being led, the speaker or worshiper needs a place to stand in front of the congregation. While plain church lecterns can get the job done, winged pulpits provide an enhanced image that will help maintain focus and draw respect. With a large reading surface and a structure that frames the person standing behind it, a winged pulpit is the optimal choice for a serious house of worship. What kind of chairs should be at the pulpit? When church leaders are not speaking or facilitating prayer services, they need an appropriate place to sit. While regular church chairs are great for congregants, ministers and lay leaders need more imposing and dignified seating. 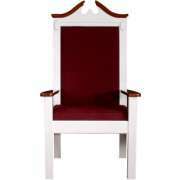 Pulpit chairs have comfortable padding and are available in a choice of rich fabric upholstery hues. They come in both side and center styles, so they look great individually or lined up in rows. When your congregants come to a house of worship for inspiration, they expect to enter a space that draws respect and evokes spiritual feelings. With the right pulpit furniture from Hertz Furniture, you can help worshipers connect to religion on a personal level. When the appropriate pieces are in place, your congregants, leaders and clergy members will have the spiritual experiences they crave and deserve.